1989, 80s Career, Retro Easy Work Clothing Patterns - MISSES'/MISSES' PETITE DRESS Loose-fitting dress, below mid-knee or below mid-calf, has notched shawl collar, extended shoulders, shoulder pads, pockets with mock bands and above elbow sleeves. A: straight, double-breasted, lower pockets with mock bands. 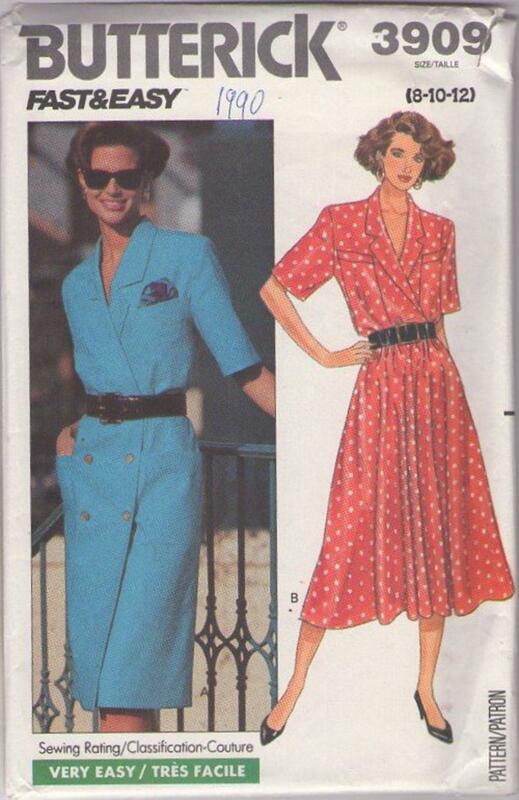 B: blouson, mock wrap bodice, elastic seamed waist and flared skirt. Purchased belt.